It is almost a rule of thumb that if the restaurant has a sign outside advertising a certain product, it will be a good product. This may not be on the front most sign but somewhere in that restaurant, if you see Tacos on the wall, they probably have some great tacos. I applied this rule even when I was in the DR. After our first night in the office, we visited a really nice restaurant called Menses. Opting to sit outside, it reminded me of 5th Ave in Naples but, much more relaxing & less crowded. Listed in multiple locations – both on the outside of the restaurant and on the menu – was Hamburgers. So, When the Sign Says Hamburgers, I order a Hamburger. Menses had a number of hamburger options on the menu. I went with the traditional burger, opting for the smallest size & requesting no bacon. I ordered my usual bottled water & Coca-Cola Light to drink, the later of which was served in a glass bottle. The burger came from pappas frittas and I did not request a different side, purely because there wasn’t a different one that sounded good to me. Our service was excellent and the atomosphere was killer. In no time at all, our food arrived. The burger itself was hidden beneth the huge bun. The bun was massive. Even after I cut the burger in half, I had to remove some of the bun before I could eat it. 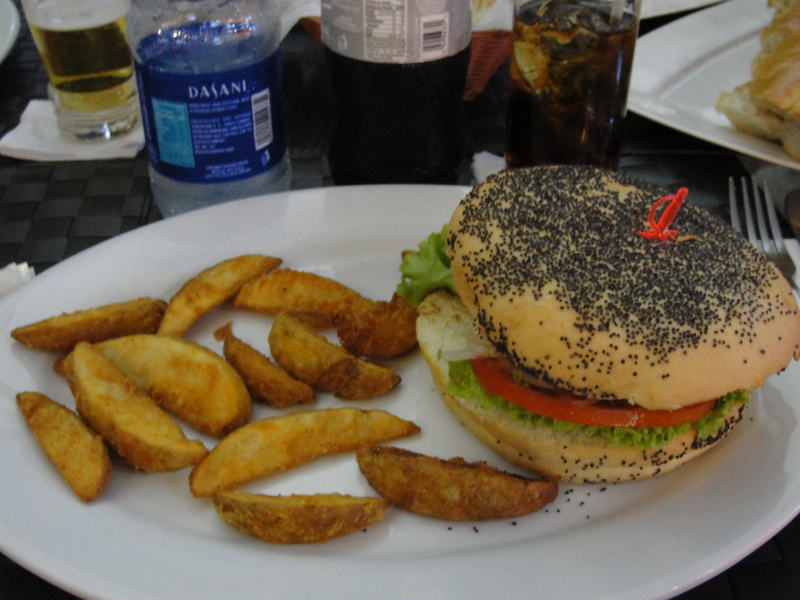 The bun was quite soft and was loaded with poppy seeds. Not my first choice to have with a burger but, good nonetheless. Even though I asked for no bacon, there was bacon on the burger. No biggie – I easily removed it and the onions that also appeared. The burger was also topped with lettuce, tomato & cheese. I found the burger to be quite good. The patty itself was slightly seasoned & very juicy. All of the toppings were super fresh and worked nicely with the burger. The only thing that was simply too much, was the bun. Otherwise, it was a fine burger indeed. The pappas frittas were thick-sliced potato pieces. I only received a small handful of these but, it was more than enough. Each piece tasted fresh, was cooked nicely and was a nice (small) side item to the burger. I easily finished the burger & pappas fritas and felt quite full & content. I really enjoyed Menses and would make an effort to return again, on any future trips to the DR. Not only was the atmosphere awesome but, the service was great & the food was quite tasty. Even though I was the only person in our group to get a Hamburger, everyone else also really enjoyed what they had. We continued to mention the restaurant throughout our trip – we all really liked it. Just remember…When the Sign Says Hamburgers…Order a Hamburger.